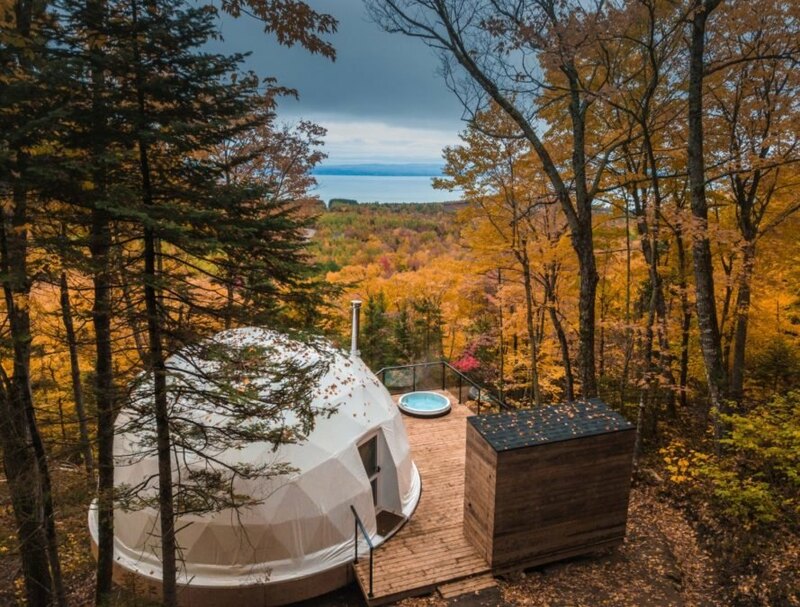 Tucked into the picturesque countryside in a remote area outside of Quebec City, the Dômes Charlevoix are three dome-shaped eco-retreats that offer luxurious stays for guests wanting to reconnect with nature. 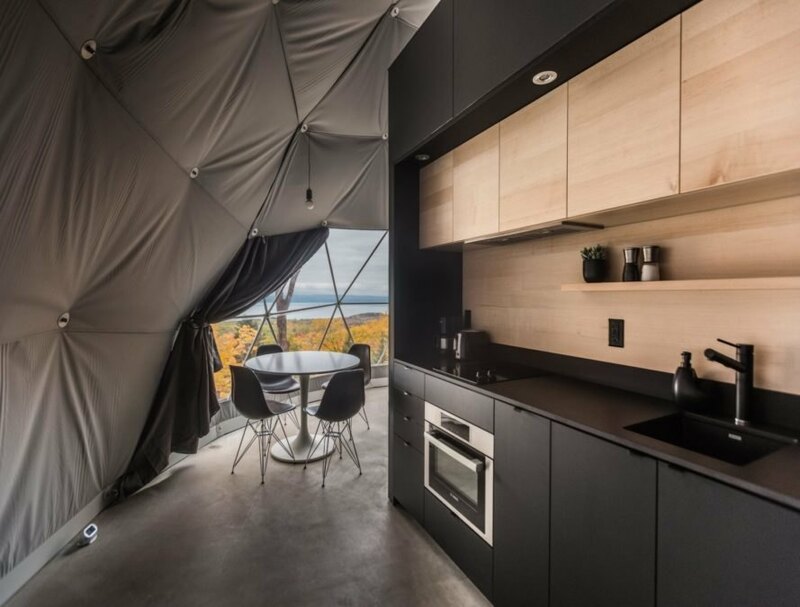 In addition to their swanky accommodations, the geodomes, which were designed by Bourgeois / Lechasseur Architects, are open year-round thanks to the numerous passive features that make them resilient to Canada’s strong winters. 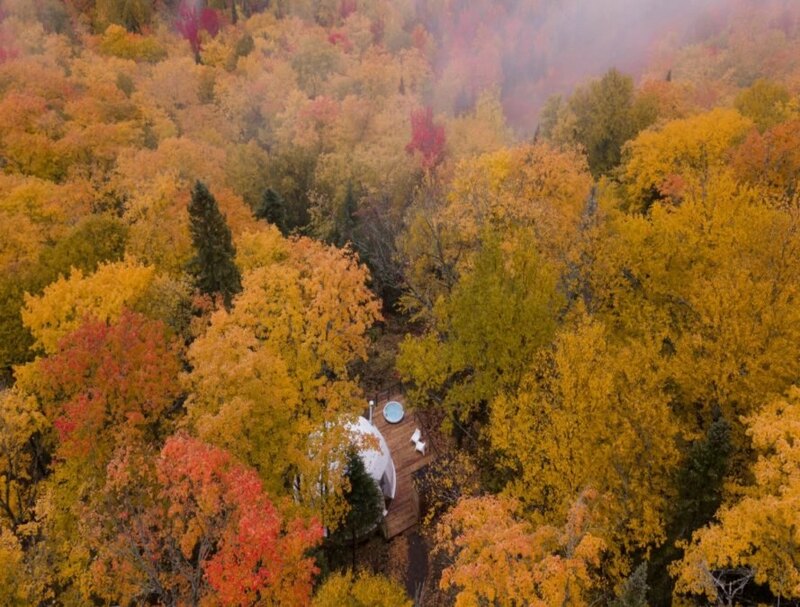 Perfectly integrated into the quaint landscape of Petite-Rivière-Saint-François, the canvas-covered domes offer guests all the amenities of a top-rated hotel. The structures are set on large wooden patios, which are elevated off the ground on large supports to reduce their impact on the land. The decks are installed with hot tubs, offering a serene place to take in the incredible views. Erected on the sloped mountainside, the domes are orientated to make the most of not only the breathtaking vistas but to also offer maximum exposure to natural light. For a resiliency that withstands the bitterly cold months, the domes were built with radiant concrete floors, which help maintain a comfortable, uniform temperature indoors. The luxurious domes sleep up to four adults, with a large queen-sized bed on the ground floor and a second queen-sized bed on a mezzanine level. 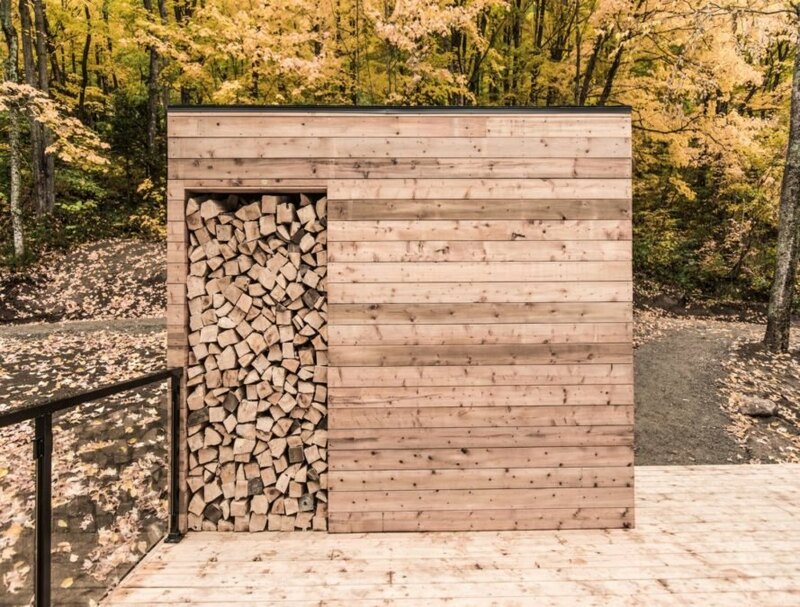 Guests will enjoy a full kitchen with a dining table, a spa-like bathroom and a large chimney with ample firewood supplied to keep the living space warm and cozy. Large windows enable guests to take in the views from the comfort of the interior, or on a nice day, they can enjoy the surroundings from the outdoor deck. All of the basic amenities such as linens are provided. Guests just need to bring their own food and plenty of energy for exploring this beautiful location. 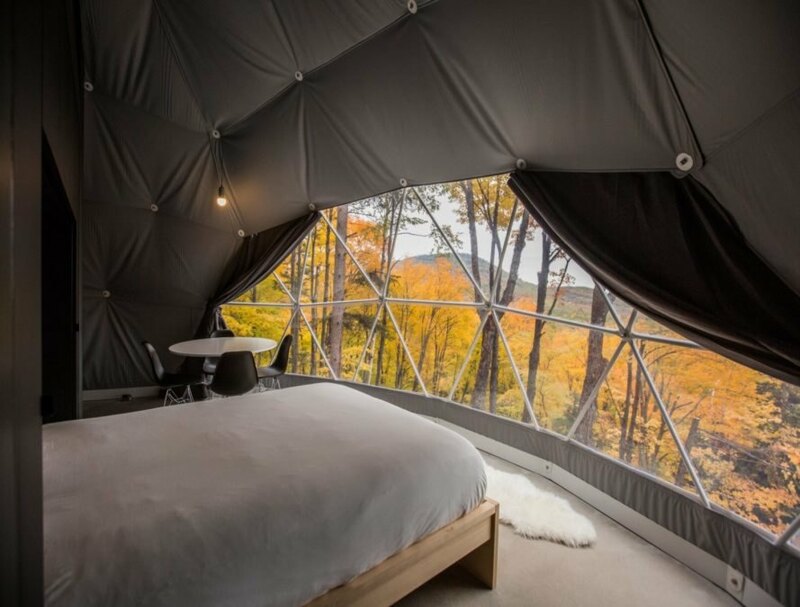 Tucked into an idyllic countryside just outside of Quebec City, the Dômes Charlevoix is an eco-retreat comprised of geodomes. The domes are built into the picturesque landscape of Petite-Rivière-Saint-François just outside of Quebec. 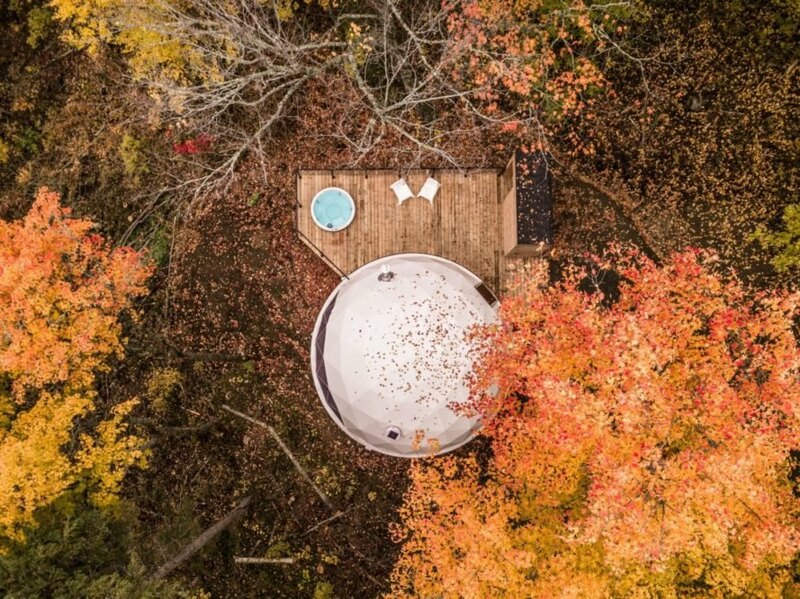 Wooden decks with hot tubs provide the perfect place to enjoy the views. The interior is illuminated with natural light. The canvas-covered domes offer guests all the amenities of a top-rated hotel. The luxurious domes come with two queen-sized beds each. The interiors are heated by radiant flooring and a large fireplace. Guests can enjoy the fully-equipped kitchens. Firewood is provided for the indoor chimneys. The homes are tucked into the breathtaking countryside. Dômes Charlevoix offers the perfect setting for reconnecting with nature.